Prior posts discuss Orson Welles and Chaplin (Citizen Kane – Modern Times), and Keaton and Alfred Hitchcock (Day Dreams and Vertigo), so how about Keaton and Orson Welles? Their paths crossed too, filming in Venice, California. 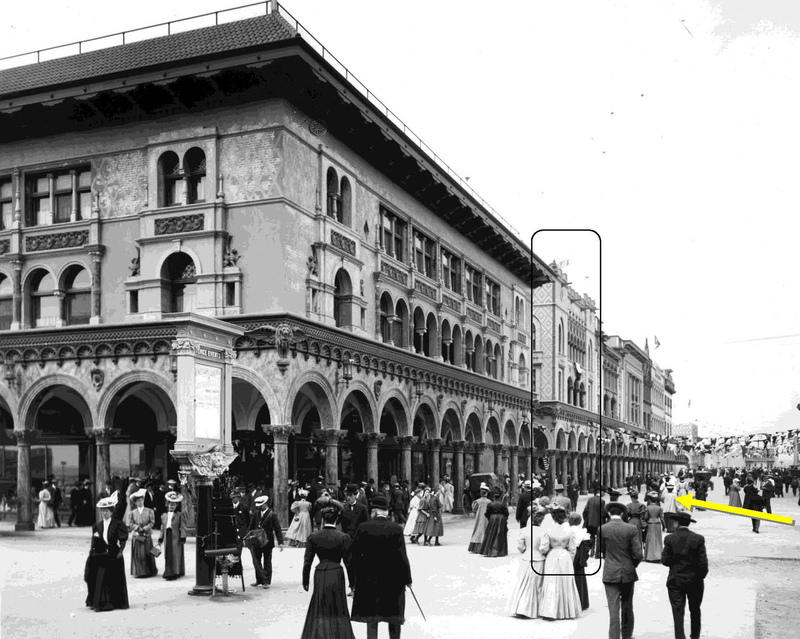 As I explain in my books, and in several posts, Venice was a very popular place to film; Chaplin, Keaton and Lloyd all filmed there frequently. 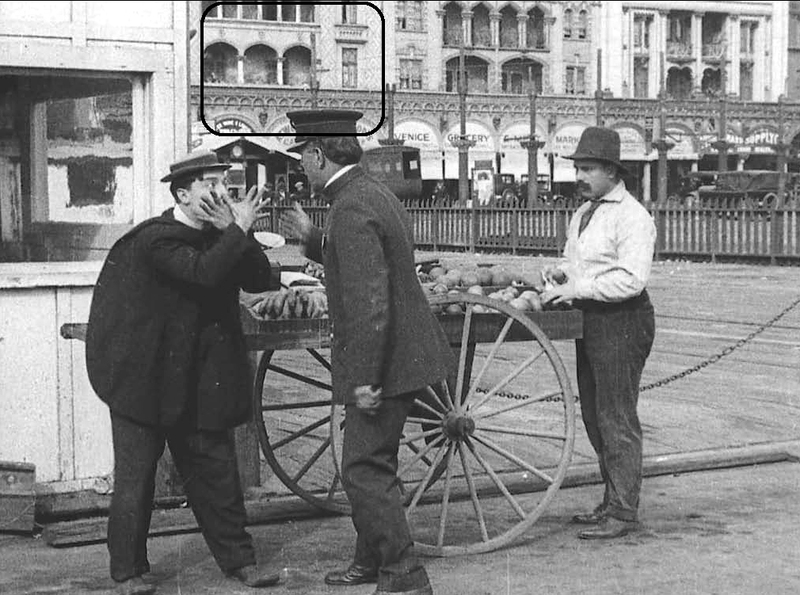 In fact, Chaplin’s public debut of his Little Tramp character was even filmed in Venice, during the Kid Auto Races (what were they? – read HERE). As was so often the case, the benign silent movie locations from the 1910s-1920s would become, after decades of accumulated grime and neglect, the stark and seedy landscapes perfect for noir dramas and crime stories. 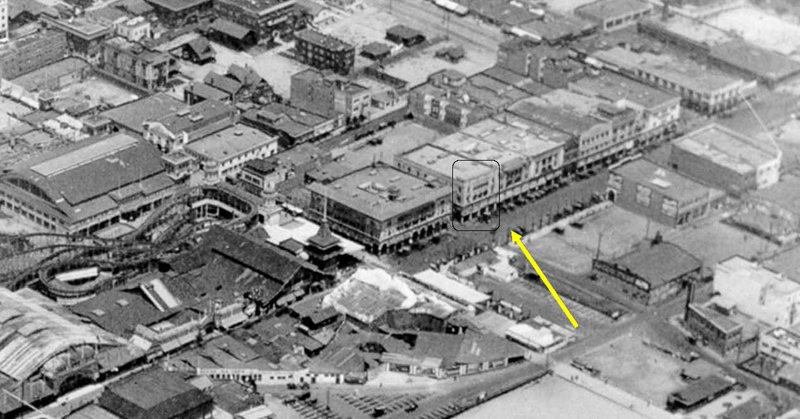 Thus, the beautiful Venice-inspired seaside resort appearing in Keaton’s 1920 produced short The High Sign would portray a corrupt Mexican border town in Touch of Evil (1958). As shown here, the building at the NE corner of Windward Avenue and Speedway (now one of the few remaining original structures), appears in both productions (see matching boxes above). 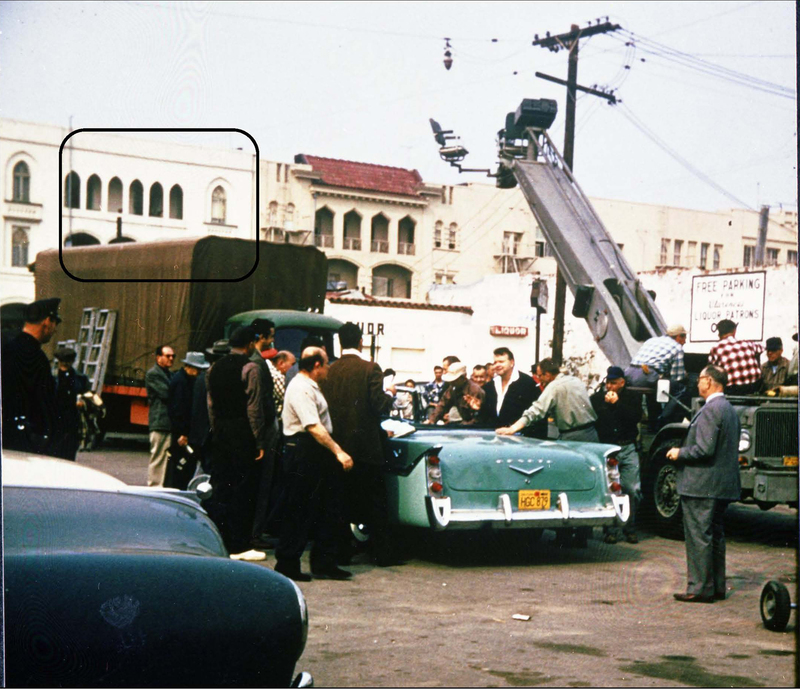 Knowing this, it’s fun to imagine what Welles would have thought had he learned his celebrated continuous tracking shot opening Touch of Evil was staged in Venice at the same spot where Buster had filmed his very first independently produced movie. Filmed at Venice; Chaplin – Kid Auto Races in Venice, By the Sea, The Adventurer, and The Circus, Keaton – The High Sign, The Balloonatic, and The Cameraman, Lloyd – Young Mr. Jazz, By the Sad Sea Waves, Number Please?, Why Pick on Me?, and Speedy. Below, a 2011 view of the NE corner of Windward and Speedway appearing in The High Sign and A Touch of Evil. The two center windows on the top floor were once shaded by six narrow Gothic arches that have since been removed. This entry was posted in Buster Keaton, Orson Welles, Venice and tagged A Touch of Evil, Buster Keaton, film noir, film noir locations, Keaton Locations, Orson Welles, Silent Comedians, Silent Movie Locations, Silent Movies, then and now. Bookmark the permalink. You are brilliant to notice the correlation between the two films!! Thank you Marc – this is only possible because you and other photo archives preserve our history for study.